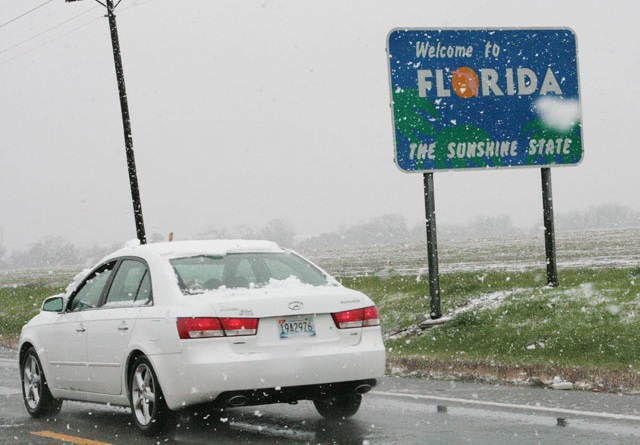 TITUSVILLE, Florida - Snow was reported falling in north Brevard County, Florida overnight on Monday, January 1, 2018. More snow flurries can be expected through Wednesday night as a blast of arctic air moves south across Florida this week. A viewer also submitted a photo of the snow flurries in Titusville to WFTV Channel 9's meteorologist Brian Shields who posted the photo on Twitter. Can it snow when local temperatures are above freezing? "Whether winter storms produce snow relies heavily on temperature, but not necessarily the temperature we feel here on the ground. Snow forms when the atmospheric temperature is at or below freezing (0 degrees Celsius or 32 degrees Fahrenheit) and there is a minimum amount of moisture in the air. If the ground temperature is at or below freezing, the snow will reach the ground. However, the snow can still reach the ground when the ground temperature is above freezing if the conditions are just right." Wednesday Showers likely. Mostly cloudy, with a high near 57. Northwest wind 10 to 15 mph, with gusts as high as 25 mph. Chance of precipitation is 70%. New precipitation amounts between a quarter and half of an inch possible. Wednesday Night Mostly cloudy during the early evening, then gradual clearing, with a low around 34. Wind chill values as low as 27. West northwest wind around 15 mph.